Continuing to refine the beak on the black skimmer. I will be edge joining the basswood boards for the base this week, these will become the water the skimmer is flying over. I am excited to begin carving the water and to get the beak immersed within it. I watched this guy, back in late November or early December, 2016 poach some short stripped bass in Rockaway Beach,... he dragged three of them back to his house on a stringer.... the stringer is incomplete here- I'll update with a better photo soon. I am excited to see how I can develop additional clay studies of fishermen. my Giclee print of an Atlantic Menhaden (Mossbunker) is available here (framed!) at a reduced price to benefit Stripers Forever. Click the link below the image to bid. Moving on to carving the beak and the base. I've added 3 new prints to my website shop: Egor, Striper (portrait), and Broom Tail- all prints can be ordered matted and framed. Here is a quick studio shot of a painting commission in progress. This black skimmer will be heading to Georgia before the end of this month. Im starting some illustrations for an ongoing project with an amazing author (names and details to follow soon), in the meantime here is a sample of some illustrations of birds, bait, fish and flies from Jamaica bay and the Rockaways. Fluke (Doormat), pencil on paper, 7" x 10"
Bay Anchovy and Finger Mullet, pencil on paper, 7" x 10"
Juvenile Menhaden (Peanut Bunker), pencil on paper, 7" x 10"
Bob's Banger, pencil on paper, 7" x 10"
Shore Break Bass and Bait, pencil on paper, 7" x 10"
Bruiser Bluefish, pencil on paper, 7" x 10"
Fluke, pencil on paper, 7" x 10"
Striper, pencil on paper, 7" x 10"
Striper (Portrait), pencil on paper, 7" x 10"
Striper (Broom Tail), pencil on paper, 7" x 10"
Swimming Striper, pencil on paper, 7" x 10"
Bucktail Deceiver, pencil on paper, 7" x 10"
Clouser Minnow, pencil on paper, 7" x 10"
Forster's Terns, pencil on paper, 7" x 10"
The maquette and full scale work next to each other. Next steps involve buying more wood and carving the base, along with continued carving on the wings, the body and the beak..
On the morning of June 16th I noticed smoke coming from the "fishing shack" at Conch's Hole Point as I made my way to Head of Bay to fish. I brought my boat closer to investigate and came upon at least two, if not four, "urban explorers" that had obviously spent the night at the shack. Their canoes were pulled up on shore, and their fire was smoldering. Immediately I began to think of the fishing and hunting camp scenes painted by Winslow Homer, and I realized that what I was witnessing was about as close as one could get in the present day to the type of explorer/trapper that Homer painted. I tried to keep the scene contemporary, and if you look closely you will notice the Verrazano Bridge in the background, as well as distant buildings and possible utility poles from the neighborhood of Arverne on the Rockaway Peninsula. This recording and panoramic photo were taken on the morning of June 15th, 2016, as I fly fished in Head of Bay, Jamaica Bay. It contains the sounds of birds, primarily oyster catchers, the whip, whip, whip of my fly casting, the shhhhhh, shhhhh, shhhhh of the fly retrieve, and the sounds of jet engines from JFK. As well, shotgun blasts can be a heard at different points throughout the recording. This is the USDA, shooting birds in the marshes, in an effort to avoid the possibility of bird strikes with arriving and departing aircraft. This is New York City. This is Queens. This 3/8" stainless steel rod is screwed into a threaded insert within the plywood and supported by surrounding basswood approximately 1" thick. A mock-up weighing about 10 pounds heavier than the sculpture is placed on the rod in order to test the cantilever, the strength of the wood and the joinery. The next step is to continue to add detail to the wings and the rest of the bird, carving in feathers and filling any gaps with wood. 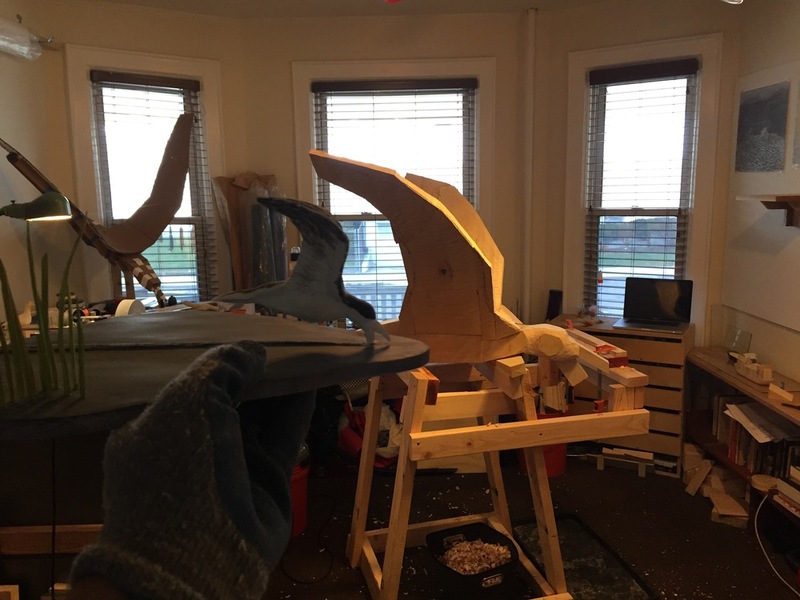 Soon the sculpture will be fitted on the base and carving on the beak will begin. Here is some rough documentation of this piece in progress as it progresses from maquette, to mock-up to finished carving. This is a maquette for a larger carving. The beak on this skimmer is still in progress (it needs some slimming and some painting.) This maquette measures approximately 11" long and 4 1/2" high, painted basswood. 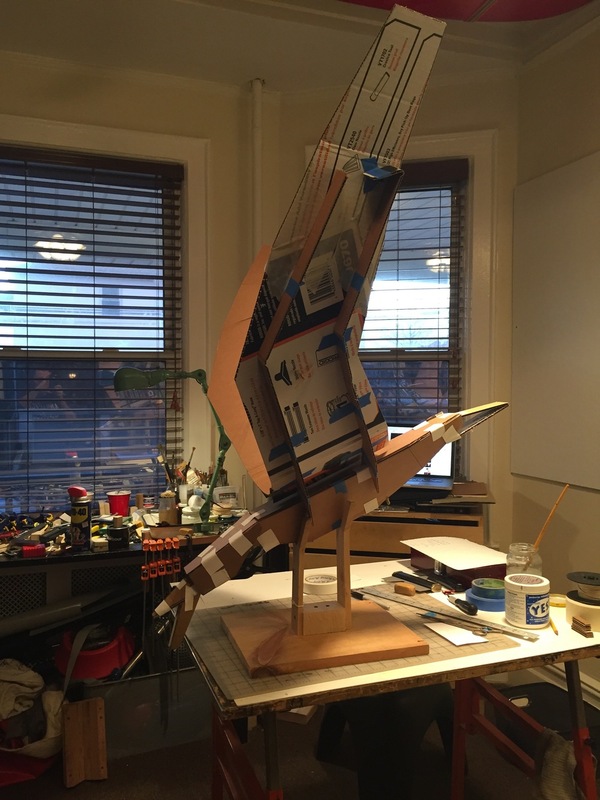 After making the maquette, a full scale mock-up was constructed out of cardboard in order to gauge the size and to get a sense of scale. Full scale drawings follow in order to help layout the rough shape of the skimmer onto basswood planks. The interior portions of the body are drilled out to reduce weight, and mortises are cut to accept the wings. Drilling holes to chisel out a mortise in the wing. A tenon/dowel is turned on the lower beak, and the head is drilled out to accept it. Within this lower beak and tenon/dowel is a 3/8" hole that runs then length of the lower beak and into the head to accept a stainless steel rod for suspending the skimmer off of what will be the carvings base. Here the lower beak has been fitted and glued to the rest of the head. A chunky, blocky version of the skimmer begins to take shape after the parts are assembled. Additional basswood is laminated to the wings in order to develop their shape. A cradle is built to hold the skimmer so that carving can begin. Basswood is now subtracted from the piece. In my next post I will update with images that show the progression of the carving.